Victoria Parker's tattoos honor five soldiers in her unit who were killed in Iraq during her second deployment there. The five men are not her brothers. But that’s what she calls them. The five initials are not for her children. But many who spot her non-sleeved left arm ask if the tight stack of black letters represents her kids. The question bothers her. From the top of her booming bicep — where “M.G. 27 JAN 07” is positioned — to the bottom of the bulge — where “B.E.” rests — Army Reserve Drill Sgt. Victoria Parker’s limb permanently honors the five fellow soldiers in her unit who were killed in Iraq during her second deployment there. 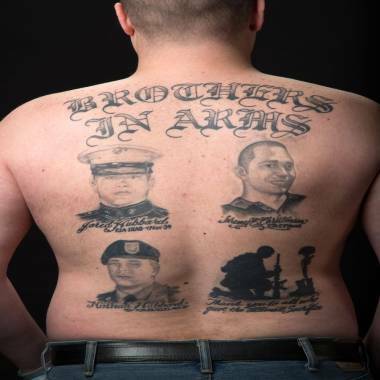 Images of those those tattoos also went on display Tuesday as part of “Vet Ink,” an exhibit at the Clark County Historical Museum in Vancouver, Wash.
“The motto is: ‘Always remember, never forgot.’ I told them I would always remember them. And by putting it on my arm, I remember them every day. I think about them every day,” said Parker, 27, who lives in Vancouver. 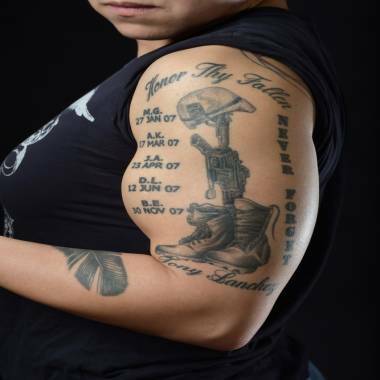 Her largest, accompanying tattoo depicts the “fallen soldier battle cross” — a helmet poised on a standing rifle placed inside empty, unlaced boots. That was inked from a photo she snapped of the memorial shrine set up for Army Sgt. Blair Emery (“B.E.”), killed in a roadside bomb attack in 2007 in Taji, just north of Baghdad. “Vet Ink” is the brainchild of Susan Tissot, executive director of the museum, located in a city rich with Army roots. Before the Civil War, then-Capt. Ulysses S. Grant was quartermaster at the Columbia Army Barracks in that town. Vancouver has also served as home to part of the 104th Infantry Division. Tattoos on the back of Jeremy Hubbard. “The Army is very prevalent in everything we do — there are a lot of veterans here, a lot of Army personnel and our former mayor was a colonel in the Army. My father-in-law is a retired Naval officer,” Tissot said. “It’s a very personal exhibit. “I knew the tattoos told a story," she added. "It’s a very touching story." “Vet Ink” spans military members who served from the 1950s through to today’s armed forces — 11 veterans (or active members or reserves) spanning every branch but the Coast Guard. Each panel details their time in uniform as well as when and why they decided to get tattooed. Some of the images, like those gracing Parker’s arm, represent the “memorial” category of ink art that recall the fallen or a certain battle. 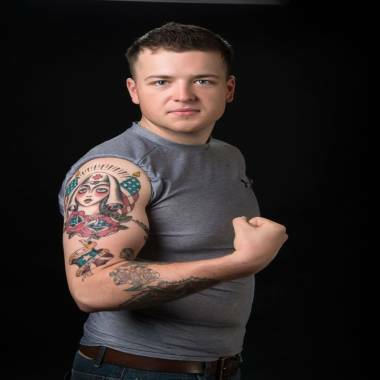 Among military tattoos — a tradition that sprouted among Navy sailors generations ago but now are commonplace among post-9/11 veterans — are the other three classes: “patriotic” (flags, eagles), “spiritual” (a star, a cross, the Virgin Mary), and “identity,” (a specific unit, battalion or division), according to Kristina Wells, the museum’s collections manager. Later, military regulations were relaxed, and banned tattoos on the neck and face. The ink also once carried something of a “hidden” code, especially in the Navy, according to the museum. For example, the image of a sparrow or swallow signified having traveled 5,000 or more miles. Tattoos of pigs or roosters were good-luck charms meant to prevent drowning because those animals often were carried in wooden crates, which would float if the ship ever sank. For Parker, the tattoos also serve as a shorthand account of her combat experiences for any other veterans who spy them — an “automatic understanding” and a “unifying symbol.” She said she and fellow veterans can read one another’s service history from their ink. But for those who haven’t served, she said, there is often misunderstanding.